The media have for the last few weeks been covering the story of a bed bug epidemic. While this makes good news it is not entirely accurate. Bed bugs are wingless insects and move around by crawling or riding from place to place in clothing, luggage or other such items. Distribution can be further exacerbated in places such as theatres and public transport, with infestations frequently occurring in hotels and other buildings where there is a high density and turnover of individuals. Bed bugs are found in bedrooms as they generally feed at night when the host is asleep. When not feeding they live in the bed frame or cracks and crevices around the room. They are reddish brown in colour turning blood red after feeding. The adult reaches approximately 5mm in length and passes through five nymph stages over a period of time to 128 days. The female lays her eggs in batches of 10 to 50, they are white in colour and deposited on various surfaces with a thin glue. They take on average 10 days to hatch and can mature into adults within one to two months given ample food. The female is then ready to start laying eggs. The speed of development depends on temperature and food availability. Surprisingly, bed bugs can live longer without food and can go without feeding for up to 140 days; the adult typically lives for about 10 months but can survive for a year or longer in cool buildings. This sensitivity to temperature means bed bugs will start to die if temperatures drop below 9ºC or rise above 36ºC. 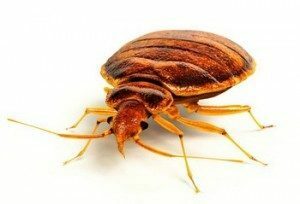 However, modern buildings have created ideal conditions for the bed bug with central heating and easy access to adjoining properties being commonplace. PESTUK recommend that before the technician arrives the bedrooms are prepared for the treatment. The rooms to be treated must be vacuumed and cleaned. The clothing, bedding and curtains from the affected bedrooms and any adjacent rooms should be removed. They should be stored in a room not slept in, within black bin bags. These items must be washed or tumble dried before returning to the treated bedrooms. Loose items such as books, DVDs, boxes, posters and children’s toys must also be removed and put in a bag in a freezer overnight. This should be done before putting objects back into a treated room. We are full members of the BPCA, the governing body for professional pest control companies. Membership is earned not given. This means that by using us you will have a fully insured company fully trained to deal with your pest problem.